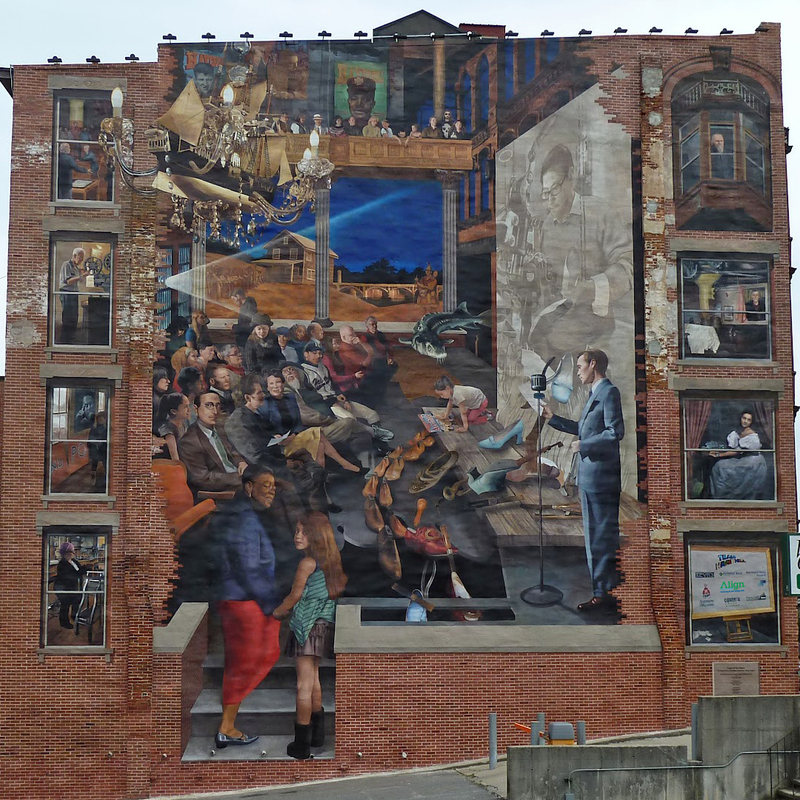 Discover the many stories within the mural! Click/tap on any of the areas of interest to discover information about the figures shown in mural. John Quincy Adams is shown here presenting the Haverhill Petition to Congress on January 24, 1842. The Haverhill Petition was an Abolitionist action which called for the dissolution of the Union. Barney Gallagher (1922-2012), a much-respected newspaper journalist, spent more than 70 years reporting on the news of Haverhill. His dedication to the city's affairs earned him the nickname, "Mr Haverhill." Today, in recognition of his efforts in journalism and civic affairs, The Eagle-Tribune and The Haverhill Gazette offer an annual scholarship to Northern Essex Community College in his name - the Barney Gallagher Journalism Scholarship Award. 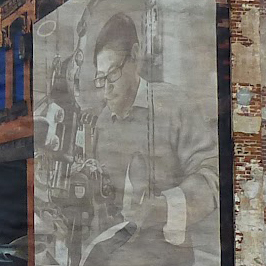 Barney Gallagher is depicted here as a projectionist—one of several archetypal figures, in this case representing Haverhill's everyday workforce. Maria Fontaine, a Visual Arts teacher in the Haverhill Public Schools for many years, as well as a mixed media artist and jewelry designer. Rowland H. Macy, Sr. (1822-1877) was an American businessman who founded the department store chain R.H. Macy and Company. Between 1843 and 1855, Macy opened four retail dry goods stores, including the original Macy's store in downtown Haverhill, established in 1851 to serve the mill industry employees of the area. These stores all failed, but he learned from his mistakes. Macy moved to New York City in 1858 and established a new store named "R.H Macy Dry Goods", which would eventually grow to become the first Macy's department store. Learn more about R.H. Macy's life and career at Wikipedia. Tom Bergeron, well-known television personality, comedian and game show host, was born in Haverhill. His first job in broadcasting was as a disc jockey at local radio station WHAV. The interior depicted in this vignette, like each of the other vignettes to the left and right of the composition, is meant to depict some aspect of Haverhill's history, industry or society. Cora Chase (1892-1984) was an outstanding opera performer who was born in Haverhill. Her talent was first recognized as a girl in the city's public schools, when she displayed a voice that was clearly of classical quality. Her musical studies took her to Italy, where she made her debut as a coloratura soprano. She joined the Metropolitan Opera Company in New York City in 1920, and signed a recording contract with RCA Victor, after being named "America's Greatest Coloratura." 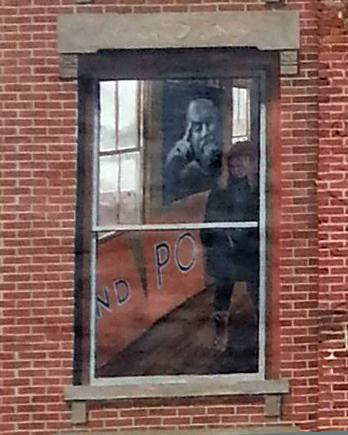 In addition to the sponsors displayed in this area of the mural, 45s—a popular card game in Haverhill—is represented by a deck of cards spilled on the floor, revealing the fives of each suit (the highest trump cards) near the top of the deck. The Essex Street Gateway Mural is a richly textured and sophisticated image that evokes the opulence and symbolism of a Renaissance painting. 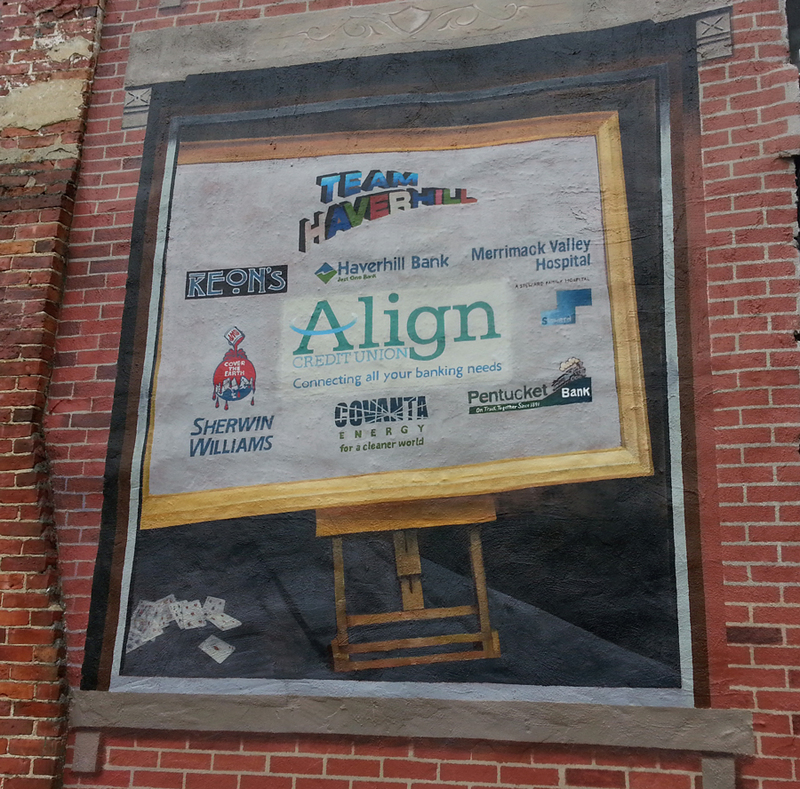 It communicates to us, through art, that the city of Haverhill has a strong sense of place and pride in its heritage. 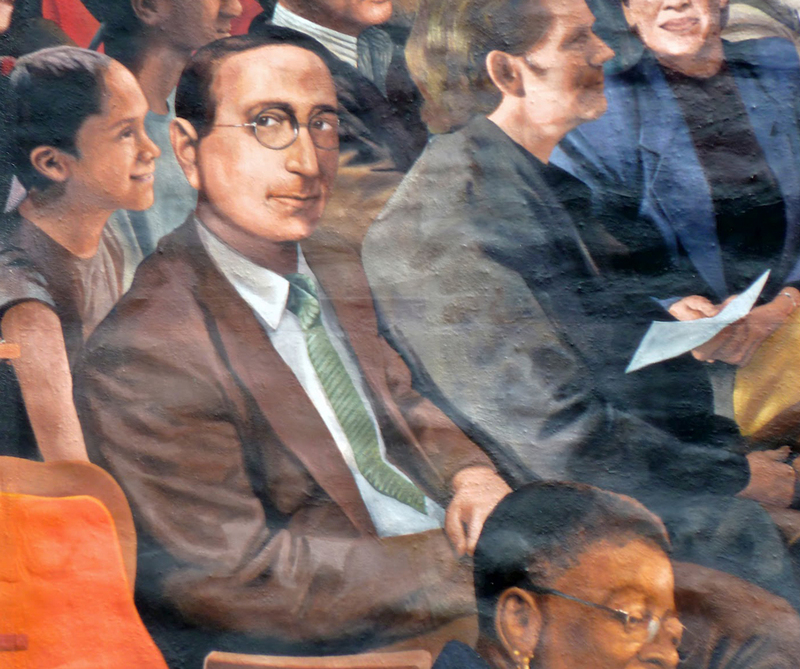 The mural is a work of fine art, a work of love, the love of a people for their city. Eugene Joseph "Gene" Goodreault (1918 – 2010), was an accomplished football player born in Haverhill. He attended Haverhill High School, where he was known as "Goo-Goo" Goodreault and was a member of the football, baseball and track teams. He then went to Boston College, where he played at the end position from 1938 to 1940. Goodreault helped lead the Eagles to a 9-2 record and the school's first bowl game appearance in the 1940 Cotton Bowl. He was selected as a consensus first-team All-American in 1940. He was inducted into the College Football Hall of Fame in 1982. Learn more about Gene Goodreault at Wikipedia. 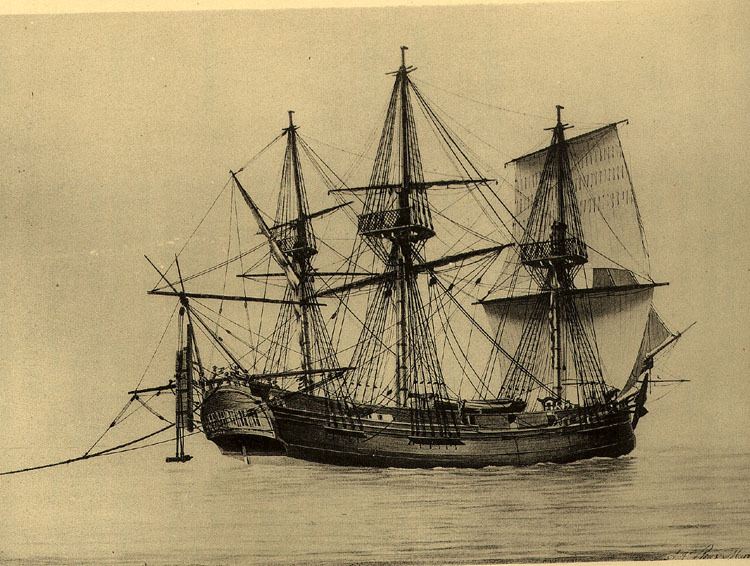 Ulysses, shown in the moral in the form of a chandelier, was a 340 ton ship built in Haverhill and registered in Salem in 1798. She was 100'6" long, 28' wide, and 13'10" deep. Initially, she had an uneventful career as a merchantman, but in August 1799 she was commissioned as a private armed vessel, commanded by William Mugford. Her primary fame in the marine literature came not from her merchant service, but from her technical achievement in surviving an immense gale. In January 1804 Ulysses left Salem for Marseille, France, and three days into this voyage, she encountered a terrific gale. She was sailing at 9 knots, when a large wave struck her astern and tore away the whole rudder and stern-post. She broached to with her mainmast sprung, and lay in this helpless position for three weeks of stormy weather. Captain Mugford was able to rig a temporary rudder within twenty days and was able, without further disaster, to enter Marseilles at the end of March. In recognition of the ingenious false rudder, Captain Mugford received a gold medal from the American Philosophical Society [Vol. VI, p. 203]. The device is also described in Bowditch's Practical Navigator. Frank "Frankie" Fontaine (1920 - 1978) was an stage, radio, film and television comedian and singer. He is best known for his appearances on television shows of the 1950s and 1960s, including The Jack Benny Program, The Jackie Gleason Show, The Tonight Show, and The Ed Sullivan Show. Learn more about Frank Fontaine on Wikipedia, or watch the video below that describes his connection to Haverhill. 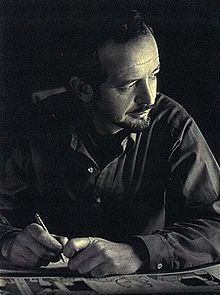 Robert William "Bob" Montana (1920 – 1975) was a comic strip artist who created the characters published by Archie Comics and in the newspaper strip Archie. Montana was born in California to parents who performed on the traveling vaudeville circuit. He knew at any early age that he wanted to be a cartoonist. When he was 16 years old, his family moved to Haverhill. For the next two years, he kept diaries of local events and news stories, illustrating the diary pages with his cartoons. The students and faculty of Haverhill High School later inspired the leading characters in the Archie cast, as revealed in a 1970s Boston Globe article by film critic Gerald Peary. Learn more about Bob Montana at Wikipedia. Or read the story (or listen to the radio episode) on WBUR, A Search For The Real-Life Archie, Betty And Friends Began In Haverhill. The Shortnose Sturgeon (Acipenser brevirostrum) is an endangered species and among the most primitive of the bony fishes. This somewhat mysterious species can be only be found in 16 to 19 river and estuary systems along the Atlantic seaboard, and one of those locations is the Merrimack River. The Shortnose Sturgeon, which grows up to 4.7 feet and weighs up to 50 pounds, use a small stretch of the Merrimack River in Haverhill to lay its eggs each year. Learn more about the Shortnose Sturgeon, including its behavior, habitat, population, and current conservation efforts at NOAA Fisheries or the Center for Biological Diversity. Sidney Mason was the first African American firefighter in Haverhill. Mr. Mason and many of Haverhill's other notables are represented here in ersatz posters for a fictitious Haverhill movie. There is an intentional level of irony in the placement of these posters throughout the composition. Rob Zombie is shown standing behind the front row of balcony seats to the right. Rob Zombie, born in Haverhill in 1965, is a musician, film director, screenwriter and film producer. Zombie rose to fame as a founding member of the heavy metal rock band White Zombie. Learn more about Rob Zombie on Wikipedia. The imagined theater is composed entirely of architectural elements from Haverhill, including trompe l'oeil elements from the actual building site here at 25 Essex Street. This scene provides a literal representation of several stories told about moving properties from along Haverhill's riverfront to locations further uphill. 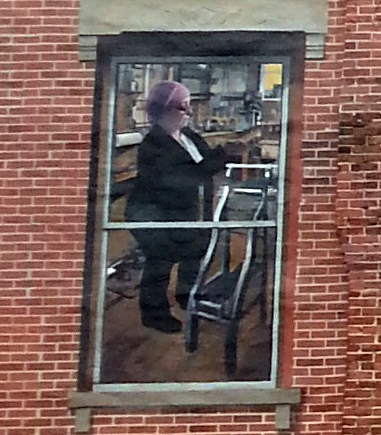 This is another image intended to represent Haverhill's determination as well as it strong connection to the past, and the interest in preserving it. Chief Passaconaway, the distinguished 16th century leader, organized Native American groups along the Merrimack River into the Penacook Federation, and led his people to resettle to the north rather than battle English settlers for the village called Pentucket, renamed Haverhill by the new residents. His spiritual and physical stature is enshrined in many stories of mystical power. Read more about the captivating story of this peace-loving man of magic and myth in Tracking Passaconaway, written by Dennis Robinson. Stuart A. Weitzman is a designer, entrepreneur and founder of the eponymous international, high-end shoe company, Stuart Weitzman. Stuart Weitzman's trademark use of unique materials (e.g., cork, vinyl, lucite, wallpaper, and 24-karat gold) and his attention to detail garnered him and his company a global following. His shoes are sold in over 70 countries. In the late 1950s, Weitzman's father, Seymour Weitzman, started a shoe factory in Haverhill, called "Seymour Shoes" (also sold under the label: "Mr. Seymour"). Stuart began designing shoes for his father's business in the early 1960s, when he was in his 20s. Read more about Stuart Weitzman's accomplished career at Wikipedia. 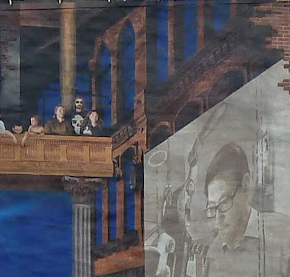 The image on the movie screen is that of a worker on an assembly line in a shoe factory. 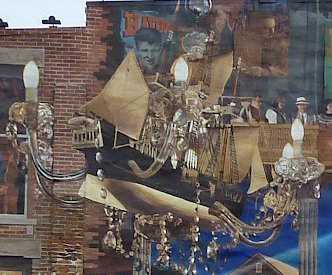 This not only depicts one of Haverhill's main industries of the past, but also serves as a metaphor for Haverhill's adoration of its history. The shoes that are being produced on the two dimensional movie screen take on shape and color as they spill out into the area where the audience is seated, representing how the industry has actively shaped Haverhill's present. 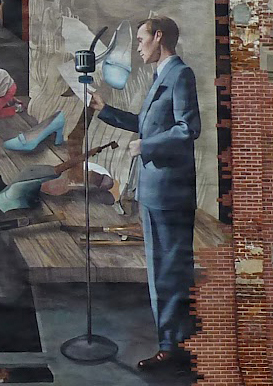 The Announcer is another archetypal figure within the mural, representing the "announcer" or "storyteller". Angelyna Sarrette, Haverhill student, shown here reading an Archie comic book. Kalister Green-Byrd and Yanna Haginicolas represent the creative link between Haverhill’s generations. Kalister Green-Byrd is known for her distinguished career in educational leadership and for her wise and loving presence in family, church, and community. 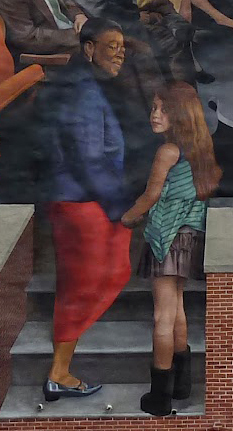 Student Yanna Haginicolas represents Haverhill’s emerging generation, and the generosity of her own family in providing the site for this mural. Louis B. Mayer (1884-1957) was a movie producer and co-founder of Metro-Goldwyn-Mayer studios (MGM) in 1924. In 1907. Mayer opened his first theater, The Orpheum, in downtown Haverhill. Read more about Mayer's life and career on Wikipedia. Frances Cole Lee, beloved teacher. 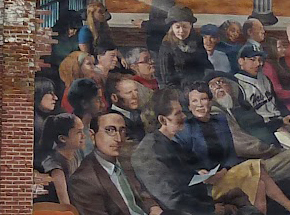 The shoes and shoe forms depicted within the mural are intended to represent the footprints of the community, and the advancement of Haverhill's future. The shoes and the shoes forms spilling out from the movie screen are shown dropping into an opening shaped like a crown — a reference to Haverhill's "Queen Slipper City" moniker. This guide is supported in part by a grant from the Haverhill Cultural Council, a local agency which is supported by the Massachusetts Cultural Council, a state agency. Team Haverhill's public art initiatives connect residents and visitors with the city's outdoor spaces, as well as its natural and cultural treasures. Through an array of public installations—including alleyway murals, whimsical shoes, trailside sculptures, and the monumental Essex Street Gateway Mural—Team Haverhill makes high quality artwork accessible to all, especially within Haverhill’s Riverfront Cultural District and along the Bradford Rail Trail. These arts-based projects celebrate familiar and hidden features of the city’s rich history, vibrant present, and emerging strength; and they foster a sense-of-place by inviting residents and visitors to examine the city’s cultural fabric, built landscapes, and natural resources through the lens of art. Learn more at teamhaverhill.org/projects/arts.